One of the greatest things that God has given humans is the ability to see beauty in the world around us. I have never noticed my dog stop and stare at the beauty of a forest or the incredible colors of a sunset, but these things have the ability to stop me in my tracks in wonder and awe. This website is my attempt to capture some of the beauty and glory of an indescribable God by capturing reflections of Him that I see in His creation. I have a camera that I don't like the quality of pictures that comes from it. But, it has an amazing grainy b&w filter setting in it. 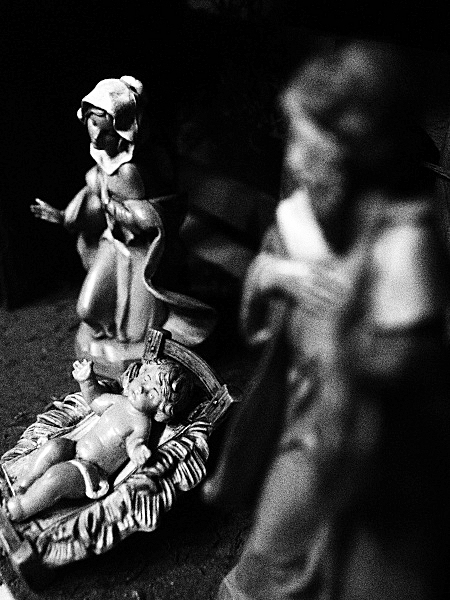 So, I'll probably post a few pictures over the coming days of our nativity set taken with that grainy b&w filter effect I love so much. Daily glimpses of God's creation as seen through the lens of a youth minister in Carlsbad, NM. Take a photo every day for the month of October...go to the blog. I enjoy photography and I always find myself wanting more time to be outside with a camera. The idea of posting my pictures was born out of the love for my wife, Alison (alisonbryantwrites.com), who hates it when I do not take my days off. This website, reflections of creation, is a way to force me to get out of the office from time to time and putting me outside where I love to be. While a creative outlet for me, I hope this is an encouraging site for you, and one which helps point you to the Creator of all this beauty around us. God is so much bigger and amazing than we could ever imagine, and He loves you and me! What an amazing thought! He loves us so much that He was even willing to let His son, Jesus, die as a sacrifice for us. That fact is more beautiful than any picture you will see on this website. I hope you know Jesus, but if you do not, please email me or go to www.needHim.org. Thanks again for coming and stop by again soon.